Polymer capacitors do not contain electrolyte. Wet Electrolytic capacitors contain a paper between the anode and cathode foil that is soaked with liquid electrolyte. Polymer capacitors use a paper which is impregnated with organic semiconductor crystal. It looks like carbon paper really although it is not. The photo above shows Sanyo OS-CON polymer capacitors on a 2006 HP DL380G4 server. Although there are motherboard manufacturers advertising that they are using Polymer capacitors on their motherboards since 2005-2006. It is not such a new technology. The above photo shows a CPU board from an old HP server with a Pentium chip on it. 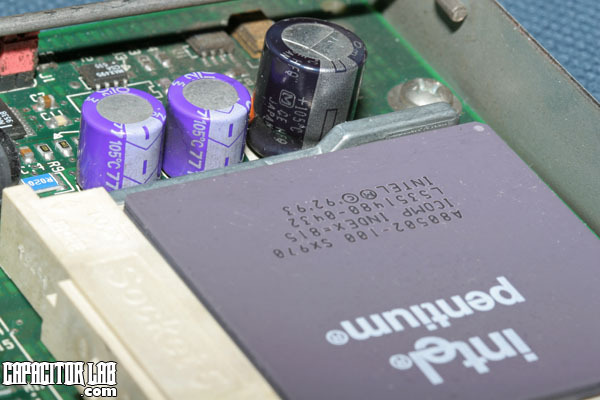 The purple capacitors are also Sanyo OSCON polymer capacitors like in the first photo. Indeed they were seen more often on server and workstation motherboards before they ever were used on consumer motherboards. In fact they have also been used on graphics cards longer than on consumer motherboards. Sanyo OSCON went into production first in 1983. Polymer capacitors are distinctive because at reasonably high capacitance values (say 300uf and above) they do not have vents whilst their wet electrolytic counterparts do. Their tops are completely flat. Due to the lack of liquid electrolyte they will never make gas when they fail and therefore do not require the vents for the gas to escape. It is important though not to confuse low capacitance value wet electrolytics (below 330uf) with polymers because they also do not have vents. The above FZ series capacitor is not a polymer capacitor, its just a normal wet electrolytic without a sleeve. We know this because we can see the K vents at the top of the capacitor. Still there are a few rare exceptions to the rule, Nichicon HD are not polymers but do not have visible vents. Fujitsu FPCAPs which are the yellow sleeved ones often seen on motherboards and graphics cards are a type of polymer cap but do have K vents. The above photo shows Sanyo OS-CON SEPC Series polymer capacitors which are typically found on the vcore output of motherboards in a row next to the processor. The ones shown are radial capacitors which means that they have two leads. One lead is positive and the other is negative. The purple hemisphere on the top of the capacitors shows which lead is the negative. If we look at the writing on top of the capacitors we can see that they are SEPC series because that is clearly written there but we can also see that they are 560uf and are rated for 4v. The numbers right at the top we can ignore because they are a date code for when the capacitor was manufactured. Can type Polymer capacitors are available in radial but also surface mount chip type for automated installation. If we take a look at the above 6600gt graphics card we can see three types of polymer capacitors there. Two of them are chip type, namely the Chemicon PSA series and the Sanyo OSCON SVP series (of which there are two groups). The last polymer capacitor on the card is a Skywell SEL series which is a radial capacitor. The chip type capacitors are soldered on top of the board. This is why they are called SMT components or surface mount technology. They have two legs, one on either of opposite sides which stick out horizontally and are soldered to two pads on the board. If we look carefully at the Skywell capacitor we can see that in fact there is a position underneath it for soldering an SMT capacitor instead. Therefore the board designer has given an option as to which type of capacitor can be used, whether radial or chip type depending on availablility and price. Whilst surface mount polymer capacitors are common on graphics cards, they not seen so often on motherboards where radial polymer capacitors are more popular. Radial capacitors are actually placed on motherboards by hand before the board goes into the solder bath in the wave solder machine. 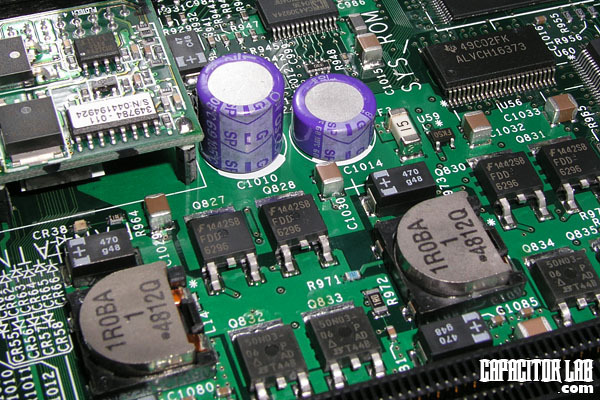 Surface mount capacitors are placed on the board by machine. Whilst graphics cards can be mostly assembled by machine, motherboards have much more larger components which have to be inserted by hand as they are too big for a machine to handle. Polymer capacitors are many times more expensive than wet electrolytics which is why they are more often seen on higher value products like graphics cards or high end and server motherboards. 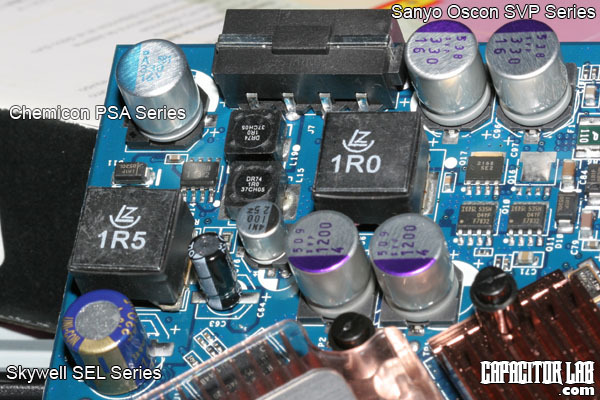 Whilst the Japanese brands of Polymer capacitors namely Sanyo, Fujitsu and Chemicon are very common on motherboards many of the taiwanese capacitor manufacturers now produce polymer capacitors for motherboards. Even the brands with well known bad reliability in wet electrolytics produce produce polymer capacitors now but there is still no reports of widespread problems with their polymer products. In early 2005 evga advertised that they were making NF3 boards with all polymer capacitors although these were seen to be Taiwanese Lelon brand. Possibly the first consumer board with all polymer capacitors. Then in Feb/06 DFI advertised their release of the limited edition LANParty UT NF4 SLI-DR Venus which had all Chemicon PSA series polymers. 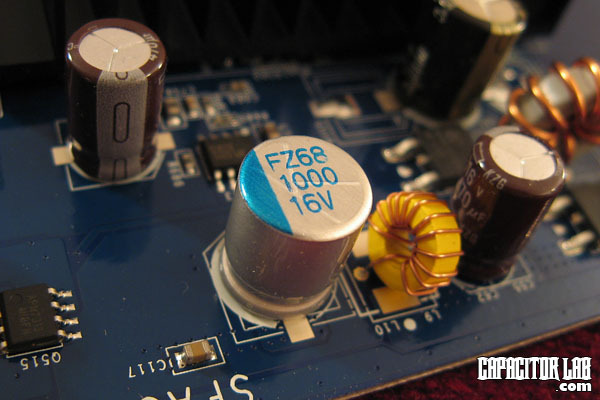 In 2007 it became more common for high end consumer boards to have all polymer capacitors. Whether all polymer capacitors is necessary in a performance sense is debatable though. Whilst Intel often uses on their boards a row of Polymer capacitors on vcore output next to the CPU, they are seen to use Nichicon VR series in the lower parts of the board which are not even a low esr series. They are definitely useful on vcore however which are probably the most stressed capacitors on the board. Polymer capacitors are characterised by lower ESR and ability to handle higher ripple current than their wet electrolytic counterparts. They are also characterised by not changing their ESR when their operating temperature changes and also having a much longer life. Sanyo quotes a 10 times increase in lifetime for a 20degC reduction in operating temperature for their OS-CON polymer capacitors whist a wet electrolytic capacitor in comparison would increase lifetime by 4 times. Low ESR is so important in electronics because the lower the ESR the faster the capacitor can discharge. This is a great benefit because it means the capacitors can respond faster to large current transitions. However there are several wet electrolytic capacitors which offer similar ESR as their polymer counterparts. The high speed power delivery to the latest CPUs subjects the capacitors in the VRM to high ripple. This is why you will see polymer capacitors more often on vcore output on the latest motherboards as they can handle much more ripple than wet electrolytics ever will. Failure of electrolytic capacitors on vcore output can be partly attributed to exposure to ripple current that was beyond their specification. Because some series of Polymer capacitors have lower ESR you can replace wet electrolytics with them but use about half the capacitance value instead. But it is important to first check the specification of both capacitors to see that you are not replacing a wet electrolytic with a polymer that has higher esr. Not all Polymer capacitors have lower ESR therefore just trying to obtain any polymer capacitor for your modding project is simply not going to be an upgrade. There are a few sources for Polymer capacitors but they are generally more difficult to obtain than wet electrolytics. Not all of the large distributors stock them. Are Polymer Capacitors the Final Solution for Motherboards? Actually Polymer capacitors are not the final solution for motherboards. Eventually the manufacturers will move to using faster digital VRMs to power CPUs which will have only small ceramic capacitors. Polymer capacitors can fail. If manufacture is not strictly done, moisture can be entrapped inside the capacitor which can lead to a steady increase in ESR. 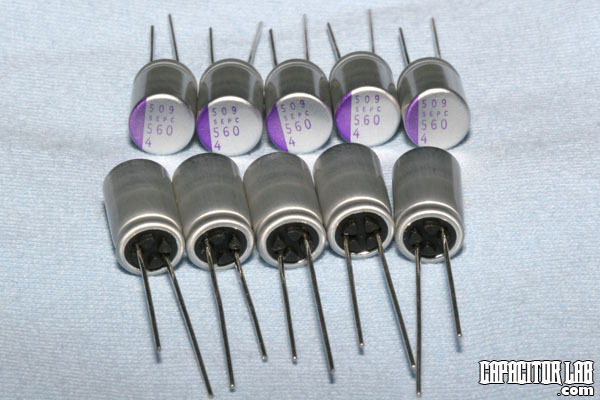 Polymer capacitors can also fail open or shorted. It is likely that they will not show any visible signs of failure though. However we are not seeing reports of failures that would indicate that polymer capacitors are unreliable.